Kashmir has been the worst victim of Internet Shutdowns in India, from 2012 to 2017 Kashmir has witnessed 31 Internet Shutdowns from 2012 as per the data available with InternetShutdowns.in. On 26-12-2012: Mobile Internet as a part of a larger mobile telephony ban was restricted on 26th January, 2012 as a standard security protocol. 15-08-2012: Mobile services were suspended on 15th August, 2012 as a precautionary measure for an hour owing to Independence Day. 21-09-2012: Mobile internet services were suspended on 21st September 2012 till 5:00 pm owing to the protests over the movie ‘Innocence of Muslims’. 26-01-2013: On the occasion of Republic Day, as a part of a security drill, mobile phone and Internet services were suspended on 26th January, 2013. 09-02-2013: TV News channels and mobile Internet banned immediately after Afzal Guru’s execution on 9th February, 2013 and restored on 15th February, 2013. 18-07-2013: Disconnect of Internet services through mobiles & dongles in the Kashmir valley post the killing of four people in the Ramban district after clashes with the Border Security Forces (BSF). 10-08-2013: The entire state experienced a blackout of mobile Internet services, lasting almost 5 days due to communal riots that spurred in the Kishtwar district of the state. 15-08-2013: Mobile Internet and telephony services were suspended on 15th August, 2013 for security reasons on Independence Day. 26-01-2014: As a precautionary measure on 26th January, 2014, mobile Internet, along with mobile telecommunication services was suspended for a few hours. 09-02-2014: Due to organization of protests at the first death anniversary of Afzal Guru mobile Internet services, and internet through plugged in devices was blocked in most parts of the Kashmir valley as a precautionary measure against apprehended violence till around 5:30 pm on 10th February,2014. 14-03-2014: The Defence Ministry had asked the Department of Telecom to selectively ban mobile Internet in some places considered ‘hot spots’ in the state on 11th March, 2014. There is no information available about the restoration of services in the area. 17-03-2014: Internet blocked in parts of Kashmir to stop political leaders from addressing a UNHRC event in Geneva via video link on 17th March, 2014. 15-08-2014: Mobile Internet services were blocked as a part of a security protocol on the occasion of Independence Day on 15th August, 2014. The services were restored within a few hours after the official ceremony was completed. 05-06-2015: Both, mobile and broadband Internet services were temporarily blocked in Jammu due to the ongoing clashes between the Sikh groups and the state police of Jammu & Kashmir on 5th June, 2015. Although broadband services were restored on 6th June, 2015, there is no information available about the restoration of mobile Internet services. 15-08-2015: Due to the sudden rise in militant activities in Kashmir, as a preventive measure, mobile Internet services were suspended from 8:30 am till 12:00 noon during the Independence Day celebrations in the area. Similar measures are adopted on both, Republic Day & Independence Day in the area every year. 25-09-2015: Mobile, and wireless Internet services were shut down during Eid celebrations on 25th September and 28th September, 2015, apprehending violence against the prohibition on cow slaughter and selling of beef in the State. 08-10-2015: Jammu experienced suspension of mobile internet services on 8th October, 2015 for around 5 hours to prevent misuse of social media after three carcasses of slaughtered cows were found in the Udhampur area, and the organization of a beef party by an independent MLA. 07-11-2015: On the visit of Prime Minister, Narendra Modi, the mobile Internet services were temporarily blocked in the Kashmir region as a precautionary measure for his high profile address at a public rally on 7th November, 2015. 26-01-2016: On the occasion of Republic Day Of India, mobile Internet services were snapped for a few hours as a precautionary measure on 26th January, 2016. 14-04-2016: To check rumor mongering about an incident that led to death of 4 people in a firing by security forces, mobile internet services were suspended in the area on 14th April, 2016 and restored on 18th April, 2016. 15-06-2016: Mobile internet services were suspended in the entire state after a youth resorted to vandalization and desecration of a temple in Jammu, that led to a spur of violence in the region on 15th June, 2016. The services were reportedly restored on 18th June, 2016. 22-06-2016: Over a controversial issue, mobile internet services were suspended in the Poonch district on 22nd June, 2016 on operational and security grounds and to prevent law and order situations and were restored on the same day. 22-06-2016: Mobile internet services were suspended in Jammu region ahead of a wrestling match, the venue for which is disputed between two communities, and experienced violence in 2014 as well. 09-07-2016: Following the killing of Burhan Wani, Kashmir valley and the Jammu region experienced a suspension of mobile internet services to check the spread of rumors by anti-social elements on 9th July, 2016.However, mobile internet services were restored in Jammu region on 26th July, 2016; after being suspended for 17 days. Reportedly, mobile internet services were restored in Kashmir valley on 19th November for post paid connections and on 27th January, 2017 for pre-paid connections. 05-08-2016: Due to bandhs being declared in the Chenab valley to show solidarity with protests being undertaken by Kashmiris, mobile internet services were suspended in Jammu region on 5th August, 2016. 13-08-2016: After the disconnect from mobile internet services since 9th July, 2016, broadband internet services were also suspended in the Kashmir valley on 13th August, 2016 for 5 days as a precautionary measure to prevent rumor mongering due to unrest between the protestors and the security forces. 12-09-2016: Ahead of Eid celebrations, broadband internet services were suspended in Kashmir on 12th September, 2016 as a precautionary measure in light of the ongoing violence in the region. These services were reportedly resumed on 17th September, 2016. However, mobile internet services remain suspended since 9th July, 2016. 08-12-2016: Mobile phone services were reportedly suspended in parts of Kashmir, including Anantnag on 8th December, 2016 as a gun-fight ensued between militants and the security forces. 08-04-2017: Both, mobile and broadband services were suspended from midnight in three districts of Srinagar, Budgam, and Gandarbal on 8th April, 2017 as a precautionary measure to curb spread of rumors ahead of the Srinagar bypoll. 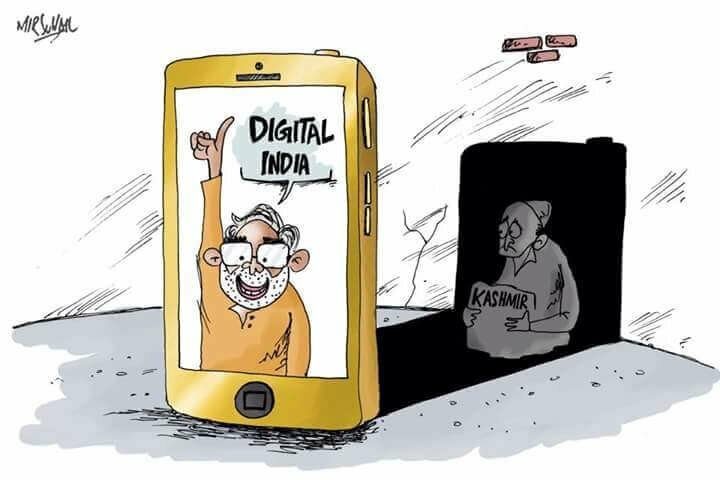 However, the restriction on Internet services was extended to the entire Kashmir valley on 9th April, 2017 and is reportedly to be in force till 12th April, 2017, until the Anantnag bypoll. 13-04-2017: On 13th April, 2017, broadband services were suspended yet again in light of re-polling in 38 stations of Budgam district. Both, broadband services, as well as mobile Internet that was suspended since 9th April, 2017 was restored in the evening of 13th April, 2017. 17-04-2017: Mobile Internet services were ordered to be suspended yet again on 17th April, 2017 as students across the Valley held protests against the recent clashes between students and police in Pulwama district. Moreover, social media websites were ordered to be restricted even on fixed line networks to restrict the spread of rumors and messages.